You too could have a “Sunflower Seeds” installation like the one created by Ai Weiwei in Tate’s Turbine Hall. 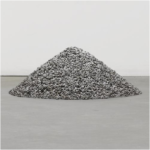 The Copenhagen-based Faurschou Gallery has just opened a show by the Chinese artist which includes half a ton of the porcelain sunflower seeds, the same as those on view at Tate. As in London, each seed was hand-painted in the ceramics town of Jingdezhen. The Danish gallery has arranged them in a cone and is asking €300,000 for the installation, which is certainly easier to display than the 150 tons of the London project. Tate was forced to prevent the public walking on its project as too much dust was being stirred up; in an unwitting parallel, the Faurschou show includes “Dust to Dust”, a bookcase containing glass jars of dust made from crushed Neolithic pottery. The show continues to March 27 2011.
Who's Selling Ai Weiwei's Sunflower Seeds at Sotheby's? The Great Sunflower Seed Mystery: How Much? What Price?